EAA Chapter 541 - Sowela Barnstormers, Inc. Welcome to EAA Chapter 541's web site. We are the SOuth WEst LouisiAna organization of the Experimental Aircraft Association based in Oshkosh, Wisconsin. We support aviation, recreational flying, and aviation education! Catch the EAA Spirit MOVIE! There are hundreds of EAA chapters throughout the world, each with the individual flavor of their own local area's aviation movement. Though each chapter may have specific goals and interests, they all support flying, aviation and its promotion. We are a diversified group of individuals that share in the love for aviation. You are welcomed to join our ranks. Click on the Becoming a Member link here or above to join us. The only thing worse than a captain who never flew as a co-pilot, is a co-pilot who was once a captain. Hand flying an ILS in a gusty crosswind is easier than adjusting the shower controls in a layover hotel. Most crew meals taste like warmed-over chicken because that's what it is. Everything is accomplished through teamwork until something goes wrong... then one pilot gets the blame. A good simulator ride is like successful surgery on a cadaver. Standard checklist practice requires pilots to read to each other procedures used every trip and recite from memory those needed once every five years. A crew scheduler is the type who wakes his wife at midnight to carry out the trash, then sends her back out to let the cat back in. An FAA investigation is conducted by non-flying types who take six months to itemize the mistakes made by a crew that had six seconds to do something. Question: My FAA medical certificate needs to be renewed. I previously reported high blood pressure and a broken arm. Can AOPA advise how to fill out the application for my upcoming medical exam? Answer: Unless the FAA Aerospace Medical Certification Division has specifically requested a follow-up report to accompany your next medical application, you should have your treating physician write a brief status report. For the blood pressure, include a mention of the medication(s) you're taking and reports of three recent blood pressure readings (taken over a few days) that show your blood pressure is still controlled. If your broken arm healed completely and you have no orthopedic limitations, you shouldn't need any new information. Just check "yes" for any items on the medical application that you answered "yes" to before, and in the explanation box, write, "previously reported, no change." As long as you are otherwise found qualified for the class of medical for which you are applying, the medical examiner may issue the certificate at the time of the examination. A great way to prepare for your FAA medical is to use TurboMedical, AOPA's online interactive medical application planning tool. 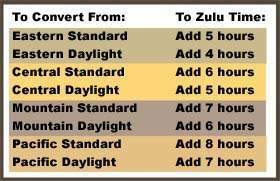 Question: I recently allowed my flight currency to lapse and took a flight review to get current again. The instructor marked most of the flight review time in my logbook as pilot in command (PIC). I thought you weren't allowed to log PIC if you were not current? Answer: Your instructor was correct in marking it PIC in your logbook. There is a difference between acting as PIC and logging PIC time. To legally act as PIC, the pilot must have a current medical certificate and have all required endorsements, ratings, and recency of experience for the type of aircraft being flown and the flight conditions under which the flight is conducted (FAR 61.3, 61.31, 61.56, 61.57). In the case of your flight review, your instructor was acting as PIC and logged his or her time as such. However, PIC can also be logged by an appropriately rated pilot, current or not, when he or she is the sole manipulator of the controls per FAR Part 61.51(e). More information is available on AOPA Online. Question: Where can I find a listing of National Weather Service (NWS) contractions? Answer: AOPA provides an alphabetized list online that includes all the NWS contractions from "abndt" (abundant) to "zr" (freezing rain). In addition, Advisory Circular 00-45E, "Aviation Weather Services," which is published jointly by the FAA and the NWS, explains the elements and the coding in METAR reports. Download the AC. Question: When setting a code into a knob-type transponder, I've been advised not to scroll through the range of numbers, especially on the first (far left) digit, but rather to carefully turn the knob to the correct numberand leave it therefor each of the digits. Can you tell me why there is concern about this? Answer: The concern is likely regarding the digit "7." When setting a new code, be careful not to scroll through the digit "7" on the far left because all codes beginning with "7" signify an emergency and will set off alarms at air traffic control centers. The code 7700 means "Help! Mayday!" and is the same as if you declare an emergency using the radio. The code 7600 means you have lost communication with air traffic control, and 7500 means that you've been hijacked. If you squawk 7500 the controller will covertly respond, "Confirm you are squawking 7500." If you confirm, your flight will be carefully monitored, and you can expect law enforcement personnel to surround your airplane when you land. Question: Do you know how I can obtain a copy of everything the FAA has in both my medical and pilot files? Answer: For a fee you can receive a copy of everything in your FAA file. Send a signed, written request, stating your name, date of birth, social security number, and/or certificate number, along with a check or money order for $10 to the FAA Airmen Certification Branch, AFS-760, Post Office Box 25082, Oklahoma City, OK 73125-0082. Or if you prefer, you can download the FAA's online request form and mail it to the above address. Question: I have high blood pressure as well as high cholesterol. I'm taking a combination of medications to treat the conditions. How can I find out if these medications are acceptable to the FAA? Answer: AOPA has a database of medications that you can search by trade name, condition, or medication type. So, using the second search option, "What medical condition does this drug treat?" choose "blood pressure" or "cholesterol reduction" (you can choose only one at a time) and then click on the button at the bottom of the page that says "search for a medicine." The result of your search will be a chart of medications alphabetized by the trade name of the drug. The chart will tell you whether each drug is FAA allowed, what its classification is, what medical condition it treats, and what medical information the FAA requires from you when you are using the drug. There is also a link for more information that will take you to AOPA's subject report on the topic. Question: I happened to be watching the old movie PT-109 the other day and the Australian coast watcher in the movie stated in his radio transmissions the words "Peter Tare." I always thought this was his name, but someone told me that "Peter" and "Tare" were part of the old phonetic alphabet. Do you know? Answer: In researching the answer to this question, we found there are dozens of phonetic alphabets used by many different groups. The words "Peter" and "Tare" were part of the pre-1954 Navy radio alphabet. Here is that complete alphabet: Able, Baker, Charlie, Dog, Easy, Fox, George, How, Item, Jig, King, Love, Mike, Nan, Oboe, Peter, Queen, Roger, Sugar, Tare, Uncle, Victor, William, X-ray, Yoke, Zebra. States list of those that publish aeronautical charts. Some also offer a separate airport directory. Some charge nominal fees. Just call and ask for the chart and directory. Alabama, 205/242-4480; Arizona, 602-255-7691; Arkansas, 501-376-6781; California, 916-322-3039; Colorado, 303-261-4418; Connecticut, 203-594-2533; Florida, 904-488-8444; Georgia, 404/-651-5204; Idaho, 208-334-8775; Illinois, 217-785-8500; Indiana, 317-232-1496; Iowa, 515-237-3301; Kansas, 785-296-2553; Kentucky, 502-564-4480; Louisiana, 504-379-1242; Maryland, 410-859-7065; Michigan, 517-335-9283; Minnesota, 651-296-8202; Mississippi, 601-354-6970; Missouri, 573-751-2589; Montana, 406-444-2506; Nebraska, 402-471-2371; New Mexico, 505-827-0332; North Carolina, 919-840-0112; North Dakota, 701-224-2748; Ohio, 614-793-5040; Oklahoma, 405-521-2377; Pennsylvania, 717-948-4642; Rhode Island, 401-737-4000; South Carolina, 803-822-5400; South Dakota, 605-773-3574; Tennessee, 615-741-3208; Texas, 512-416-4502; Utah, 801-533-5057; Vermont, 802-828-2093; Virginia, 804-236-3624; Washington, 206-764-4131; West Virginia, 304-558-0330; Wisconsin, 608-266-3351; Wyoming, 307-777-4880. 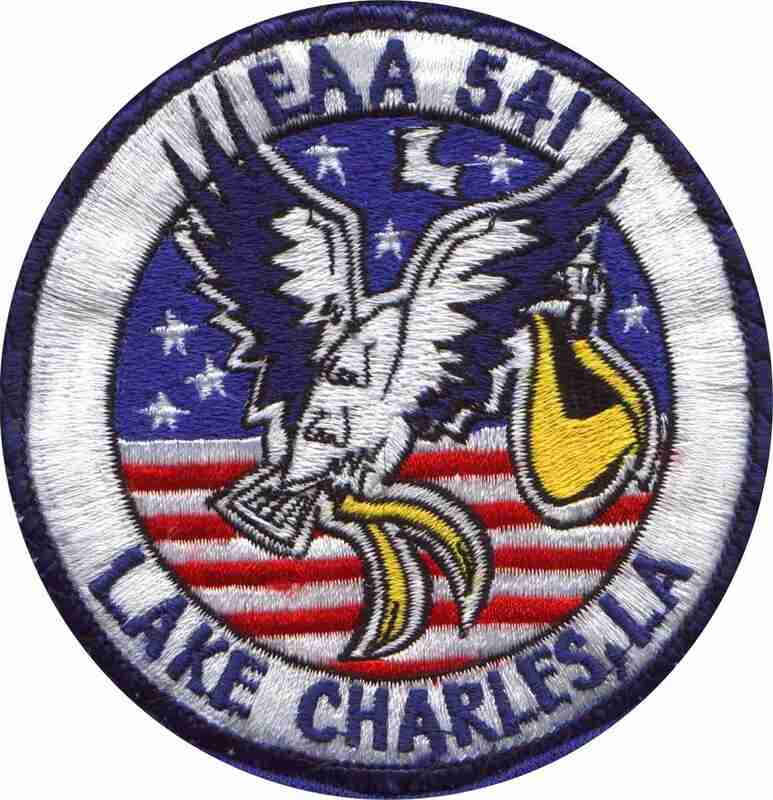 Our Chapter's official name is The Experimental Aircraft Association, SOWELA Barnstormers, Chapter 541 of Louisiana, Inc. We span the SOuthWEst LouisiAna area. Monthly meetings, as listed in the by-laws are the last Tuesday of the month. However, we have adapted our regular meeting DAY to Saturdays. We try to have cookouts quarterly and one can usually find a number of us on any given Saturday at the Bourbon Street Restaurant inside the Jennings Travel Center (Truck Stop). You are welcome to join us. 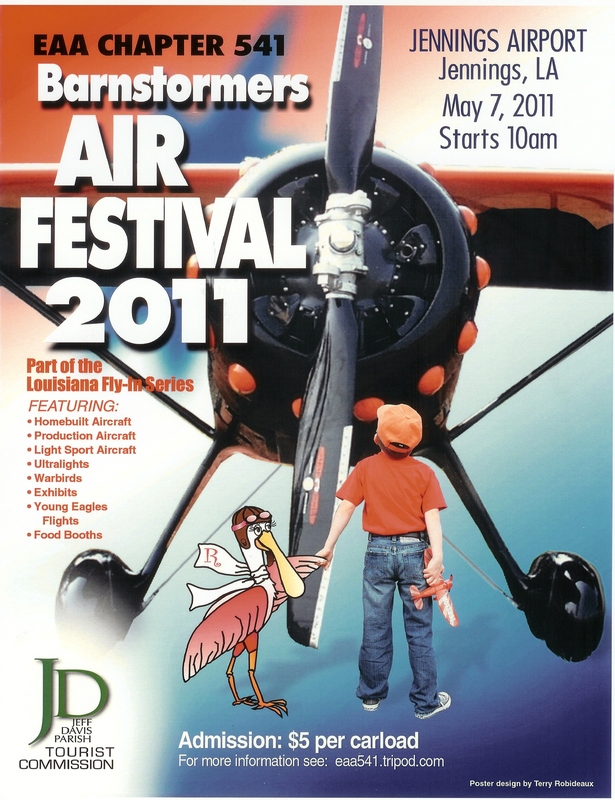 NEXT MEETING: EAA Chapter 541's Barnstormer Air Festival, Saturday (May 7th) at 10 AM. PLAN TO BE THERE!!!! Click on the Air Festival tab at the top of the page for a bigger poster. SOWELA Technical Community College is a major local contributor to world-wide aviation. Their Aviation Maintenance Technology course offers an Associate Degree in Applied Science and many A & P mechanics and pilots have been produced from this fine program. Chapter 541 Board member and EAA Technical Advisor Glenn Carter heads up the Aviation department and is eager to help any member with information concerning aviation and homebuilt aircraft. Those interested in becoming a student can visit their web site by clicking HERE or by calling 337-491-2692. One of the first steps in planning your AirVenture experience is now available online! The EAA AirVenture Planning Guide is a downloadable pamphlet that features basic information about The World’s Greatest Aviation Celebration, plus such essential items as admission rates, housing options, and disabled visitor services. HITCHIN' A RIDE: USE EAA AIRVENTURE RIDESHARE FOR TRAVELING TO OSHKOSH. Here's something GREAT from the National EAA. It's a program called rideshare designed to get you to Airventure with someone who has room to share or to provide someone room to ride with you if you have it available. Something we've been trying to get started locally. If you have room or need a ride, contact the chapter via the website by clicking here and we'll provide a listing on the site. If you want to check out the Hitchin' a Ride site on the EAA web click here: RIDESHARE. The FAA, AMT's, Pilots and Safety all come together at http://www.faasafety.gov! We’re often asked “what are the benefits of belonging to EAA?” The answer can be a long one depending on what that individual’s interests are as EAA has a vast offering of benefits and services. They are evolving and improving all the time. But let’s start with the basics and explore what’s new in a $40 EAA membership. Every member receives his/her choice of a monthly magazine. EAA SPORT AVIATION is the flagship monthly publication for members interested in the broad scope of recreational aviation with editorial geared to the flying, buying, building, restoring and maintaining of all types of aircraft. We are currently in the process of expanding our coverage of production aircraft news and hands-on topics. EAA SPORT PILOT & LIGHT SPORT AIRCRAFT magazine is new just this year and its editorial is aimed at those who’ll fly the newest special light-sport aircraft, including fixed wings, trikes, powered parachutes, gyrocopters, gliders, and Part 103 ultralights. Your membership includes a choice of either membership or you can add on the additional magazine. EAA’s Insurance Program has expanded with the addition of insurance for students and renters. This non-owner insurance plan is Sport Pilot-ready. In addition EAA, and Falcon Insurance have developed an outstanding insurance plan for all types of aircraft including expanded coverage, service and great pricing for members. Call 866-647-4322 for a free quote or visit www.eaa.org. EAA membership also includes preferred rates on other lines of personal insurance. With the new Sport Pilot movement, EAA’s technical team is the leader in helping all aviators understand what the new ruling means and how it helps reduce the traditional time and cost barriers associated with training and aircraft ownership. We have a special brochure series that answers many of the questions members have on this topic. If you’d like to receive this information or have a question on Sport Pilot, please don’t hesitate to give us a call or visit the website at www.sportpilot.org. Another new benefit of EAA membership this year is unlimited admission to the EAA AirVenture Museum in Oshkosh. That’s right all members can visit the museum as often as they like-- at no additional charge. The EAA membership umbrella includes the wonderful ability to join a local chapter and participate in all of its activities. You are on Chapter 541's web site now. EAA members also have the opportunity to join one or all of EAA’s affiliate organizations: EAA Warbirds of America, EAA’s Vintage Aircraft Association, and the International Aerobatic Club division of EAA. Another affiliate of EAA is the National Association of Flight Instructors. The EAA Homebuilt Aircraft Council reaffirms EAA’s commitment to its homebuilding roots. There’s something for everyone! With the EAA Flight Planner, EAA members can easily plan a VFR flight, view a route on current maps (including Sectional, WACs and other) check NOTAMs and weather, file with DUATs and many other functions. This $50 value is free for EAA members, just check out the website at www.eaa.org for more information. For individual services, EAA provides a wealth of educational and technical benefits. Access to pilot programs such as EAA Technical Counselors, Flight Advisors, Aeromedical Advisors, and Aviation Information Services reps are ready to answer your aviation questions at 888/322-4636. EAA’s education opportunities include SportAir workshops held around the country, the perfect place to learn about aircraft building and restoration. Call 800/967-5746 for all the details. Working with kids via the EAA Young Eagles program gives the next generation of aviation enthusiasts the chance to take to the sky. EAA members provide an introductory flight experience for kids aged 8-17. Members have flown more than 1,100,000 Young Eagles since the program’s inception. Call 877/806-8902 for more information or click on the menu above to visit Chapter 541's Young Eagle page. EAA’s Air Academy aviation camps provide a resident camp at Oshkosh headquarters for youth who are aged 12-18 interested in aviation. Reach the Air Academy at 888/322-3229. Finally, the discounts! Great deals and discounts for EAA members abound: you can save on everything from member discounts on Ford vehicles, John Deere equipment, Hertz car rentals, travel services, and even a preferred rate on the EAA VISA® credit card. The amateur-built aircraft accident rate declined significantly over the past year, and the FAA gives considerable credit for the drop to EAA's proactive safety programs that continually improve safety and competence among homebuilders. FAA says the homebuilt aircraft accident rate dropped 25 percent for the 12-month period ending September 30, 2003. Over that same period, the fatal accident rate fell 36 percent. At the same time, total U.S. homebuilt aircraft registrations grew to more than 25,000. EAA's Homebuilt Aircraft Council, a volunteer committee of EAA'ers who are experienced builders, provides solid support for EAA Technical Counselors, who advise builders during aircraft construction or restoration, and EAA Flight Advisors, who help pilots evaluate their own flying skills as they transition to newly constructed or restored aircraft. EAA Chapters provide excellent forums for homebuilders as they complete their aircraft projects. Most of the 1,250 EAA Technical Counselors and 560 EAA Flight Advisors are associated with at least one local Chapter. CHECK BACK OFTEN FOR CHANGES!